If you prefer a spicier crawfish boil I would suggest that you add a tablespoon of cayenne pepper and also add a bay leaf which imparts a lot of flavor to the boil water. Put three gallons of water into a big pot, such as a gumbo pot or boiler. Add to this, the lemons, cut in halves, the bell pepper, which has been cut in half and seeded, the two stems celery, cut in half and the whole onions, skinned. Add beaucoup salt and black pepper. 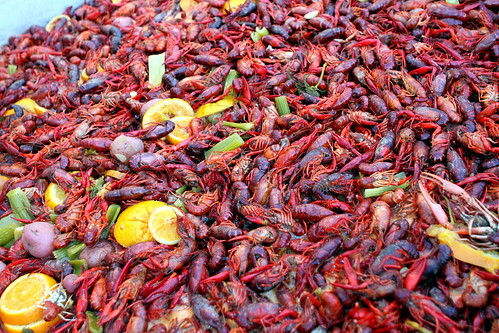 Bring to full boil, drop in live crawfish, one at the time, or by the handful. Boil for fifteen minutes. Do not let crawfish stay in water. This will make them soggy. Pick up crawfish with a colander and put into large pans. To go with the boiled crawfish, mix together all sauce ingredients and chill until ready to serve.